Above: Gino captured this KiMo angle during our May InstaMeet (see p. 11 for winners). Want to snap your own shot? Call (505) 768-3544 or go to kimotheatre@cabq.gov for details on tours in this, the KiMo’s 90th anniversary year. 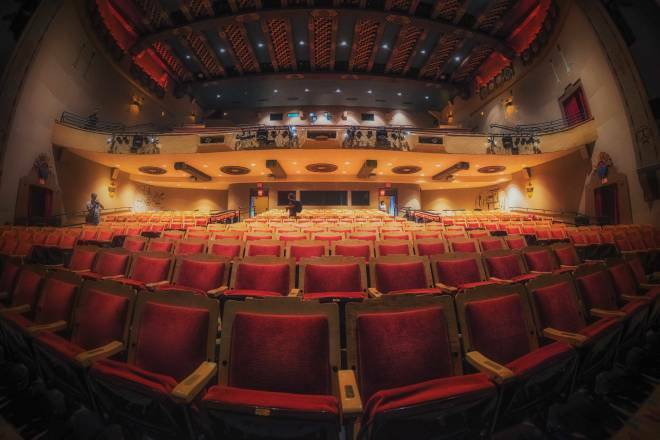 “It’s the cultural cornerstone of downtown Albuquerque,” says Harvey Hoshour, whose firm, Hoshour and Pearson, restored and recycled Albuquerque’s historic KiMo Theatre. The appellation implies visibility as well as history and function, and certainly the KiMo is visible at the corner of Fifth and Central Avenue. Indeed, with its heraldry brightened and refurbished, the theatre is a cynosure. Not only that, the KiMo puts a center to the city’s beautification effort around its new Fourth Street mall, because now that the old Franciscan Hotel is gone the theatre building dominates its area physically. But perhaps the most satisfying thing is that this Albuquerque landmark is still joyously in its place after 57 years, not a mere survivor from a lost world but a resource renewed.